We are a group of men, women and young people who share a common interest; fish and fishing. As a club we believe fly fishing, both as a science and an art, is one of the most enjoyable and interesting ways to catch fish. Learning to fly fish is not difficult. In fact, the DVFF was founded in 1968 to promote fly fishing. A large part of achieving this goal involves teaching and educating people who are genuinely interested in improving their fishing skills. DVFF provides the opportunity for members to get the most out of their fishing hours. Classes, social events and fishing outings are just a few of the activities offered to DVFF members. Regular programs allow participants to learn something new every month. In addition to organized events, fellow club members give you the opportunity to learn from their experience through informal conversations and discussions. Members have the opportunity to develop lasting relationships with many outstanding members of our community. Fly fishing has long been recognized as one of the most effective means of catching fish. All types of fish. Trout, probably the most sought after freshwater fish by fly casters, are found anywhere from streams and rivers to high alpine lakes. However, fly fishing is equally effective for many species of fish, such as salmon, steelhead, shad, striped bass, black bass and panfish. Purely saltwater species such as bonito and bonefish readily take a fly. In short, one can enjoy fishing for just about any species with a fly rod, line, leader and an artificial fly. Enjoy these varied species through our many programs and outings. Let the DVFF show you the way! 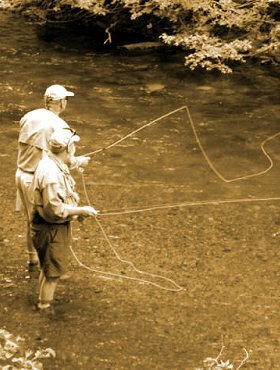 The Diablo Valley Fly Fishermen is dedicated to preserving our beautiful environment, protecting its wildlife and promoting good sportsmanship practices. Catch and release fishing, and using barb-less hooks, is strongly encouraged. The club is affiliated with other conservation groups such as California Trout, Trout Unlimited and The Fall River Conservancy. Through our annual auction we raise money to contribute to several wonderful organizations. As a club, the DVFF has worked on many conservation projects such as the enhancement of the spawning habitat for largemouth bass at San Pablo Reservoir, improvement of the Nature Conservancy's McCloud River Preserve, and established the Robert Wisecarver Scholarship Fund to reward U.C. Davis students for their research on anadromous fish species - just to name a few. The DVFF is a fully affiliated club of Project Healing Waters Fly Fishing Inc. (PHWFF), which is dedicated to the physical and emotional rehabilitation of disabled active military service personnel and veterans through fly fishing and fly tying education and outings. The DVFF supports the PHWFF-Martinez, CA program, which aids the Martinez (Calif.) VA in helping to heal those who have served in the United States armed forces. In 1977, the International Federation of Fly Fishers (IFFF) awarded the McKensie Cup to the DVFF for its outstanding contributions and named the DVFF the club of the year. To conclude, the DVFF is one of the largest and most active FFF chapters in the United States. 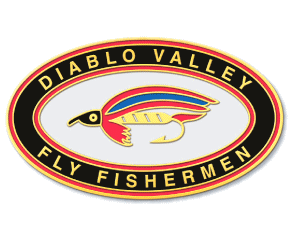 Diablo Valley Fly Fishermen is organized as a 501 (c) (7) Social Club, nonprofit organization. As such, it can receive donations but the donations are not tax deductible to the donor.